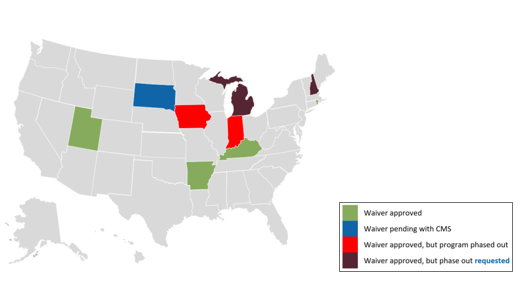 The map below shows the states using 1115 waivers to incorporate premium assistance programs through employer and/or individual Marketplace. In addition to the extension of adult coverage at higher income levels, recent federal regulatory developments provide the ability to use tax advantaged employer Health Reimbursement Arrangement (HRA) contributions to purchase coverage on the individual market. This may increase the viability of premium assistance for the working Medicaid population by making individual coverage options more attractive. States designing premium assistance programs must demonstrate cost effectiveness and must have wrap-around and cost sharing provisions in place to ensure that benefits are equivalent to, and out of pocket expenses are no greater, for enrollees than they would have been under traditional Medicaid. To implement a premium assistance program, the state must develop a methodology to assure that premium assistance costs no more than enrollment in Medicaid. When premium assistance operates under an 1115 waiver, budget neutrality must also be assured. Cost effectiveness determinations may be made on an aggregate program basis or an individual basis. Methods for determining cost effectiveness include determining if the commercial plan (employer sponsored or individual coverage) cost is less than the capitation payment for a beneficiary enrolled in a Medicaid MCO or alternatively analyzing the individual claims history and projecting the cost of covering the individual on a private plan. In addition, the benefits in the plan are reviewed to ensure the commercial plan offers comprehensive coverage. This review also supports the cost effectiveness determination that the out of pocket costs are reasonable as compared to the costs of providing Medicaid coverage. . Tools can be developed to streamline plan review and the cost effectiveness determination process. Premium assistance programs require that Medicaid provide wrap-around benefits for the individual in addition to what is provided on the commercial insurance coverage. This applies to both benefits that may not be covered by the commercial coverage . The complexity of wrapping benefits can increase when different Medicaid populations have benefits that vary from state plan Medicaid services, such as when a Medicaid expansion population receives benefits via an Alternative Benefit Plan which differs from the Medicaid state plan (https://www.healthmanagement.com/wp-content/uploads/061318-HMA-Roundup.pdf). Under premium assistance Medicaid remains the payer or last resort and claims payment for individuals enrolled in premium assistance requires (commercial insurance) and Medicaid. An example of benefits wrapped to an Alternative Benefits Plan (ABP) is provided below. Premium assistance programs require that Medicaid eligible individuals enrolled in premium assistance have cost sharing no higher than present in Medicaid. Members must be reimbursed for the premium cost of enrollment, or a method to coordinate with the employer or health plan must be put in place to assure that the premiums are no higher for premium assistance than for Medicaid enrollment. Comparably, where the private plan includes copayments, co-insurance, or deductibles, Medicaid must cover any of these costs under premium assistance that are more than the Medicaid allowable cost sharing amounts. Expanding the footprint of existing HIPP programs and implementing new Medicaid premium assistance programs offer opportunities for developing unique program designs. Member participation in employer sponsored or Marketplace plan coverage for Medicaid beneficiaries may be mandatory, requiring participation where cost effective commercial plans are available, or voluntary, allowing the beneficiary to elect the coverage. Requirements on the members can by extension become requirements on employers, since if Medicaid beneficiaries must enroll in the employer coverage then employers may be required to engage with the members and Medicaid agency to support that enrollment. Commercial plans typically offer family coverage with the same coverage type and networks to their employees. Medicaid enrollment typically looks at each individual singularly. For premium assistance programs, leveraging the ability to enroll entire families into commercial plans may support cost effectiveness. Considering options on how to model family coverage under Medicaid when designing premium assistance programs can maximize the effectiveness of these programs. When premium assistance is primarily administered through employer plans, the responsibilities and roles of the employers and employees (Medicaid beneficiaries ) become important points in program design. The following table describes some of the possible employer vs. employee roles. State outreach to the employer community to provide information for all the ESI plans offered by the employer, including dental and vision. The employee or member will need to provide to the state their ESI plan information. The plan information may include the Summary of Benefits and Coverage or Summary Plan Description which may not be easy for the member to find. State request for employer to verify employment and other confirmations as requested for eligible members. Member to verify employment and other plan enrollment details as requested by the state. Some states may request a paystub or other documentation from the member enrolled in the program to provide proof of employment in the absence of an employer role. In addition, renewal timing is another consideration for programs. Renewal timing and ‘open enrollment’ for these commercial plans are typically at the end of the calendar year. The renewal period is likely different than the member’s annual Medicaid recertification period. As a result, a member may renew their ESI and recertify Medicaid at different times. Aligning the Medicaid and employer renewal periods for individuals with premiums assistance can streamline operational processes and between Medicaid and commercial coverage. Premium assistance programs will continue to evolve as Medicaid expansion population and Marketplace coverage requirements and policies change. For example, the new federal proposal to allow employer contributions to pay for could lead to new regulations that would have an impact on states’ premium assistance program designs. For programs administered primarily through individuals plans, the coordination between Medicaid and the Marketplace is key to ensure eligibility and coverage requirements are met. Leveraging premium assistance programs may provide more healthcare continuity for working members as coverage from their employer plan will remain in effect even if a change in income has an impact on their Medicaid eligibility. For more information, please contact Erin Mathies.